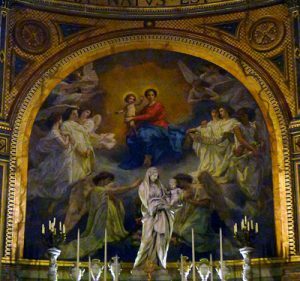 Paris is littered with dozens of gorgeous churches, and many end up on tourists’ must-see lists: Notre Dame, Sainte-Chapelle, Sacre Coeur, Saint-Sulpice. 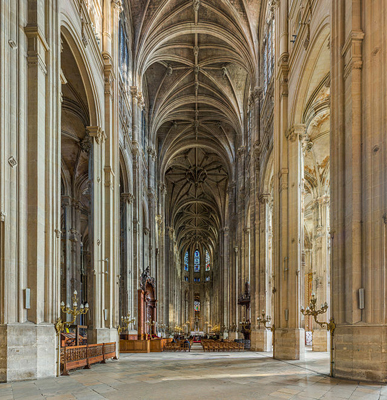 But one of the City of Light’s most impressive houses of worship that stands guard over the Les Halles neighborhood is not visited nearly as often as it should be—L’Eglise Saint-Eustache. And that’s a shame, because many visitors to Paris rate this church as one of the city’s finest, both inside and out. 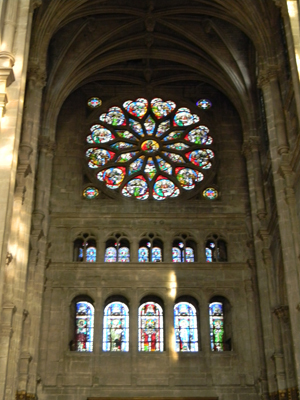 Built between 1532 and 1637, Saint-Eustache’s roots actually can be traced back to the 13th century when a small chapel was opened in the year 1223 to honor the food merchants working in the Les Halles neighborhood, particularly the areas fishmongers whose products were taxed to help construct the parish church, then named Saint-Agnes. As the church grew, funded by the food tax, it was renamed Saint-Eustache after Roman general-turned Christian martyr Placidus (who changed his name to Eustachius after converting to Christianity). Eustachius and his family were burned at the stake for embracing Christianity. Reportedly, several unspecified relics of Saint Eustache were housed in the church, but The New York Times reports that in 1907 these were stolen. Construction on the current facility—considered by many architects to be one of the world’s finest Gothic structures—was started in the 16th century. Although the architects of Saint-Eustache are officially unknown, the church is strikingly similar to a cathedral in Pontoise, France, that was designed by Jean Delamarre and Pierre Le Mercier, leading many to believe the pair also was responsible for the Paris church’s design. The most well-known of the church’s chapels are the Chapel of the Virgin, built in 1640 and restored in the early 1800s (and officially inaugurated by Pope Pius VII just in time for the coronation of Napoleon, although the emperor’s actual coronation ceremony was held inside Notre Dame), and the Apse Chapel that houses the sculpture “Virgin and Child” by Jean-Baptiste Pigalle and three large paintings by Thomas Couture. The largest pipe organ in France. 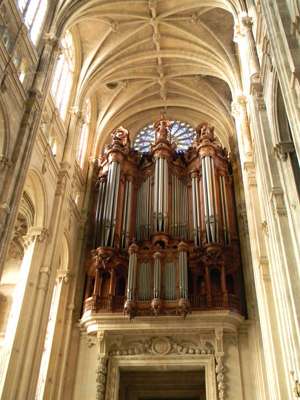 Additionally, Sainte-Eustache is home to the largest pipe organ in France, consisting of 8,000 pipes. The organ (rebuilt in 1989 by Dutch firm Van Den Heuvel) was so renowned that it was chosen for the premieres of composer Hector Berlioz’s organ-and-orchestra piece “Te Deum” in 1855 and Franz Liszt’s “Christus” in 1886. Two other relatively famous sculptures also are located at the church (one inside, one in the main courtyard outside)—“L’Ecoute (Listen)” by Henri de Miller, which is installed just outside the church (and has inspired a gazillion photos of tourists pretending to pick the concrete statue’s nose) and a Keith Haring triptych piece, titled “The Life of Christ,” inside one of the house of worship’s side chapels. 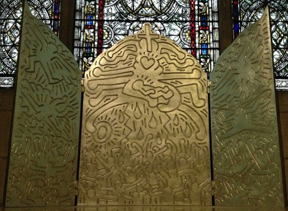 Although one might believe it odd for an ultra-modern Haring work to appear inside a Gothic Parisian church, the integration of the piece is actually quite seamless and it makes a fine addition to the wonderful art inside Saint-Eustache. L’Eglise Saint-Eustache played a major role in the lives of France’s royalty and aristocracy upon its completion, serving as the site of the first communion for King Louis XIV, the funeral for the mother of composer Wolfgang Amadeus Mozart, and the baptisms of Richelieu (a Roman Catholic Cardinal and chief minister to King Louis XIII), Jeanne-Antoinette Poisson (who later become Madame de Pompadour, mistress to King Louis XV and a major patron of art, literature and architecture), Jeanne Baptiste d’Albert de Luynes (a French noblewoman and renowned art collector) and playwright Moliere, who also was married here. 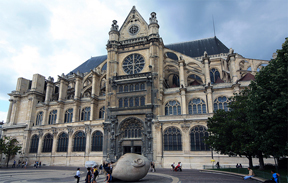 Saint-Eustache is officially located at 2 Impasse Saint-Eustache (Metro: Les Halles), but the church is easily seen looming over the entire Les Halles park-shopping center-transportation hub. Catholic Mass is held here at 12:30 and 6 p.m. Monday through Friday, 6 p.m. on Saturday, and at 9:30 a.m. (held in the Chapel of the Virgin), 11 a.m. (which includes music by the organ, organ choir and the Saint-Eustache singers) and 6 p.m. (which includes music by the organ and organ choir) on Sunday. The church is otherwise open to the public from 9:30 a.m. to 7 p.m. Monday-Friday, and 9 a.m.to 7 p.m. on Saturday-Sunday. Free organ recitals also are held every Sunday before Mass at 10:45 a.m. and 5:30 p.m. This entry was posted in Art, Beauty of Paris, Churches, French history, Les Halles, Music, Right Bank, Sight-seeing and tagged Saint Eustache by Bob Adams. Bookmark the permalink.